In trance, as well as in dreams, when I “become” Owl or Wolf, I very often see flirrrrry wavering wavy lines, flowing in front of me. Several times I described them as “tram lines” going of into the distance, where I am supposed to follow…. North alignment with Earth magnetic fields. 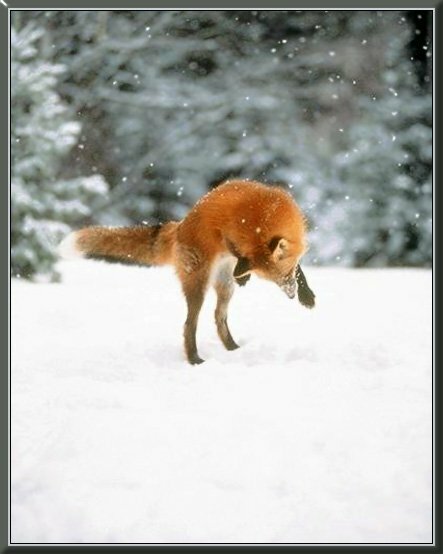 Foxes can see/ sense the lines of the Earth magnetic field and they make out their prey as a blurry spot / deviance in the lines…. It helps them to locate something they hear beneath grass or snow but can not visually see as we do. Scientists say, that Foxes, Dogs and Wolves can see earth Magnetic lines, but not see in colour. I think that is wrong. They see more and different colours than we can make out. Their vision is set up differently then ours. I think most Animal’s is. I can see colour when I am Wolf. However the colours are different! 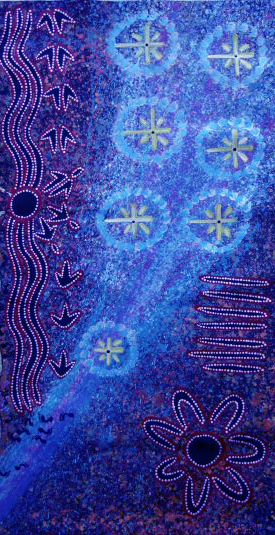 More like the picture of the Australian Aborigine dot art I post here, most often in shades of blue (Wolf) and yellow (Owl) but other times also in more shades of colours. This makes this a painting from the Wolf’s point of view! Earth magnetic fields: According to scientists, Robins can see them with their right eye but with their left they are supposedly seeing “regular stuffff “- like objects in their environment ??? …like how we would see them.. But not only Robins; Owls too! 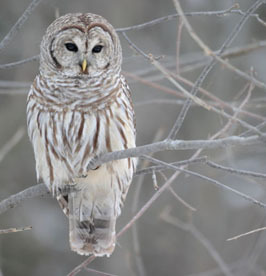 In trance I can see the Spirit Lines my Owl Guardian follows. 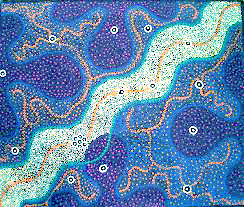 I also can “see”, where a Mouse ran and the track-lines of other Animals, Humans – where they have been and also follow them backward to where a specific incident happened or where they have been and lost something- like a house-key….. So how are these lines related to the Earth magnetic lines? Most humans can not sense the Earth magnetic fields, but others are very sensitive to ley lines and other Energy lines. This reminds me about the dousing course I did with a strange guy called Barry Fell….and him saying, that crossing the Energy lines are dangerous…. Then how come we evolved with and among them? That does not make sense to me. Ifff they were in any way harmful to humans and we do need crystals or copper rods or whatever to divert them away from our home/ property, we just simply would not be here, living together with the Animals, who use them daily. Animals including birds and turtles can detect the Earth’s magnetic field, and use the field to navigate during migration. Cows and wild deer tend to align their bodies north-south while relaxing, but not when the animals are under high voltage power lines, leading researchers to believe magnetism is responsible. Migratory birds may use two electromagnetic tools to find their destinations: one that is entirely innate and another that relies on experience. A young bird on its first migration flies in the correct direction according to the Earth’s magnetic field, but does not know how far the journey will be. It does this through a radical pair mechanism whereby chemical reactions in special photo pigments sensitive to long wavelengths are affected by the field ( The chain of reactions is initiated by a blue light photon,) Note, that although this only works during daylight hours, it does not use the position of the sun in any way. At this stage the bird is similar to a boy scout with a compass but no map, until it grows accustomed to the journey and can put its other facilities to use. With experience they learn various landmarks and this “mapping” is done by magnetites in the trigeminal system, which tell the bird how strong the field is. Because birds migrate between northern and southern regions, the magnetic field strengths at different latitudes let it interpret the radical pair mechanism more accurately and let it know when it has reached its destination. More recent research has found a neural connection between the eye and “Cluster N”, the part of the fore-brain that is active during migration orientation, suggesting that birds may actually be able to see the magnetic field of the earth. For the last little while I have been going through a few health troubles myself. As a kid of 12 in the christian orphanage I was among others also beaten with a whip. This whip was a magnificent specimen: lovingly hand created by its owner, a nun, out of a metal curtain rod and several swine’s leather straps that featured fine little nails at its tips,- specificity for the purpose of inflicting utmost pain on the back, legs chest of naughty little children. I was a repeat victim of this nun’s administrations. 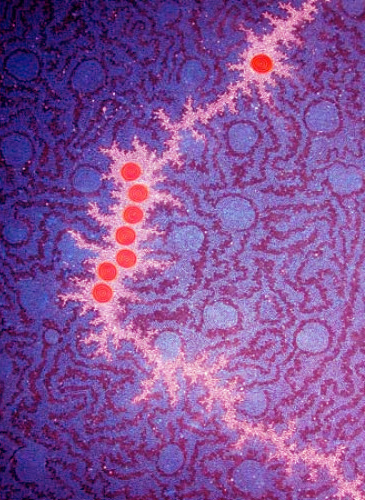 Now, by that time I was well versed at escaping the physical pain by slipping into an “up”trance where I was able to view the whole scene with detachment as from ”above”, but that nasty little whip split open my right breast and that wound subsequently infected, like many of my other welts…. Over the years on and of this has given me problems. Bacteria and sadly also fungi had back then infiltrated a breast cyst and from time to time they rear their nasty heads and I end up with swollen angry painful cysts, that need to be drained and that usually scarrrre the living hell out of my Doctors. They show up on mammograms and then the alarm bells go on and everyone thinks I will be very dead in a matter of months…. Well – usually it turns out to be – same old same old, ….but – the older I get, the more calcified scar tissue I have and – yes, something “bad” may develop….. Since mid November I have been dealing with another such flare-up and was sent from test to test and from biopsy to biopsy….. But I also did my own healing-work. That encompasses draining these angry cysts myself with a syringe and fine needle, cleansing them with 0.9% salt solution as well as working with my Helping Spirits and shamanic Medicines. Among other things I drummed into my naked chest and smudged and cleansed and prayed and meditated. I slept on my Bear fur, praying for healing….. In early January, a week before my husband left for a 1 month stay in Germany with his ailing mother, who was undergoing heart surgery, I was worrried. So i went to ask my Ancestor Spirits, iffff I was Ok or – …. I drummed and traveled up our Tree of Life to “go see” Umai Ee’ne. with that in mind I stayed calm and send Peter on his way to take care of his mom. Last week I first had yet another biopsy and after that the doctors ordered me into the hospital for an emergency breast sonogram on a Sunday morning. That is now 8 days ago. I have not heard a single piep from the doctors. No news is good news, right!?! Deep inside me, I knew, I would be OK. I was in the Forest. And there was Grandma Ulali! We were beside a wide fast flowing river, at the very edge of several cataracts. 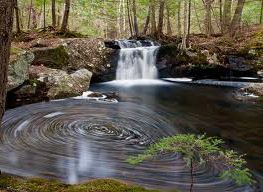 Right in front of us, there was sort of a whirlpool, where the churning waters had carved a deeeeep round pot-like hole into the slick rock. 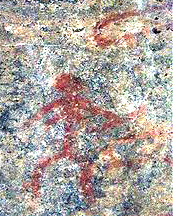 There were many pictographs there – red markings – Otter- and Reindeer and Bear! Bear with a large heart-line uniting his Breath-Soul with his Heart-Blood Soul. I just however saw his head. He proceeded to peck at my right breast and pecked out all that was “bad” and then put small green bubbles of air-and plant material into the open wound, that subsequently closed up. It did not hurt at all and I was not afraid, I was soooooo glad, he did that. Then Ulali pulled on the string and I went back up…. and there again was the torrents of icy water, but this time I felt, they were cleansing me and I drank from the water as much as I could. When I was back on the rocks, the cocoon was gone, so were all the pictographs. But the sun was there. I looked up into it – and awoke on my Bear fur. In my early 20ties I was working as an RN at the psychiatric clinic at a large university hospital and was struggling to incorporate the elements of my shamanic / tribal upbringing and World view into my work with patients and clients. At the time I was a member of a group of Native American medical students, all in different stages of their training, that were facing similar challenges and had therefore come together in a spiritual/ social support group, meeting almost daily, cooking and eating together, studying and cramming for exams together and also coming together in worship, which largely took the form of Peyote meetings in keeping with the Native American Church. There I learned the prayers, songs, chants, ritual and also acquirer a rudimentary grasp of the Lakota and Inde’ languages. But I also had 2 Finnish friends, who made me aware of the rich shamanistic tradition of their homeland, underlining, that this was so much closer and in keeping with my Siberian traditions. First and foremost they introduced me to the Kalevala, the Finnish folk myth and its runes = songs/ chants about the heroes of Finnish myth, their exploits, their spells, charms, their magic and their stories. First painstakingly collected and formated into an epic by the Finnish Doctor Elias Lönnrot throughout much of his life (and revised and expanded several times…) the Kalevala preserves the the many previously only orally transmitted runes, magic incantations and spells and wove them into what today is regarded as a Finnish National Treasure. There first and foremost is Väinämöinen who is the elder wise man, tragic loner and a magic musician. 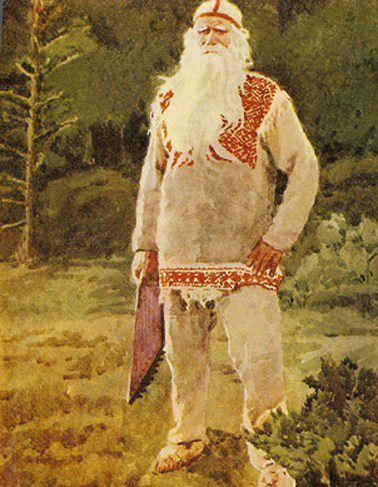 Born from Ilmatar, the Mother Spirit of Air, who was pregnant with him for 700 years and birthed him in the sea, he knows all the runes and spells to form and create and bewitch his contemporaries and create magical instruments like the very first kantele, made from the jaw of a large pike, his tangible gift to the people of Finland. There is his buddy, Ilmarinen, the heavenly smith, master of iron and Fire who creates magical talismans like the Sampo, but also replicas of the Sun and the Moon. There we have the whimsical Aino, Ilmarinen’s sister, who refuses to marry Väinämöinen and changes herself into a Pike. There is the young swashbuckling Lemminkäinen, son of a powerful lady shaman who learned all kinds of charms and rune spells from his mom and still gets in all kinds of trouble …. Then also there is the magical Sampo, the treasure that the smith Ilmarinen is asked to forge while chanting spells and that will bring happiness, protection and prosperity to its owners. I was fascinated by the Kalevala and having an 6 week summer holiday coming up, I decided not to go back to New Mexico but to travel to Finland and immerse myself into the landscape, its Spirits and the runes of the Kalevala. Another friend of the family had a summer cottage near Hämeenlinna and that became my temporary home base. I was soon introduced to Yalava, a lady in her mid sixties, who still knew how to sing a few of the old runes. In itself that is not very surprising, since many parts of the Kalevala as well as other rune circles have been set to music by the Finish composer Jean Sibelius starting in 1890 with the story of the tragic mythic hero Kullervo.. The work of Sibelius soon was recognized as yet another Finish cultural treasure and still is popular to this day. 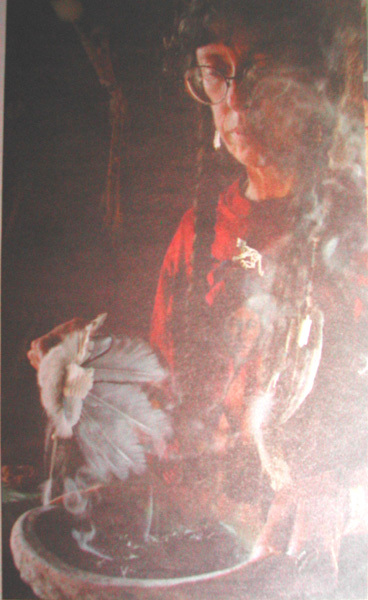 Yalava however also knew a few different chants from her Sami grandmother, that had much more of a shamanistic feel. I loved listening to her. All she used to accompany herself was a strand of small bells – from the tack of a domesticated Reindeer and, at times, a branch of long dried Oak leaves, that made a rusteling swirrling sound. Another Rune singer Yalava knew was Olaus and he also had a Runebomme, a traditional Finish drum that needed to be tightened over a fire and was beaten with a piece of Reindeer antler. Incidentaly it was most often not in the house, but outside or in the sauna, that my new- found friends shared the songs and stories of “the olden times”.I got introduced to the Spirits of the Land, of specific Trees in the area and to the Animals, like the “Guika” the Northern Diver – the Loon, the Moose and the Bear, who was not permitted to be called by his name – less he comes. That was/ is very much in keeping with my own Siberian tradition. 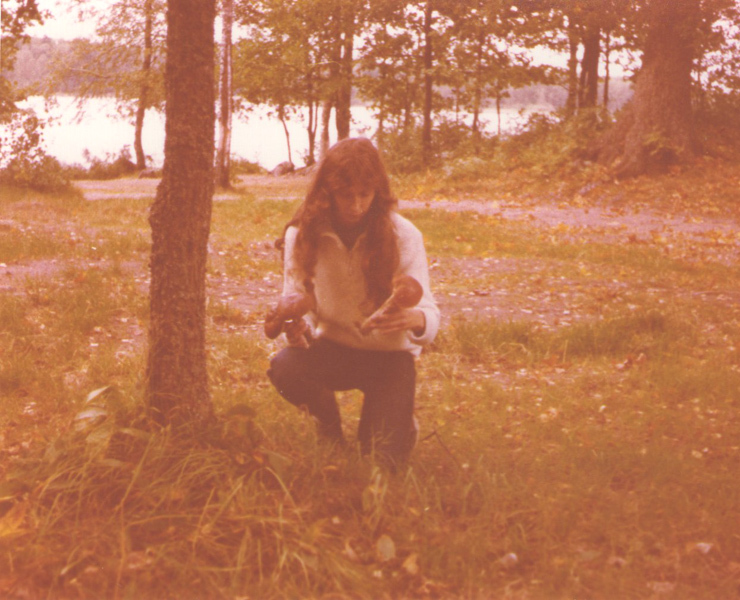 Especially the stories about the Bear and my own connection to Bear via my mother’s side of the family, (Usari) eventually encouraged me to do a 3 night “sit out” deep in the forest. 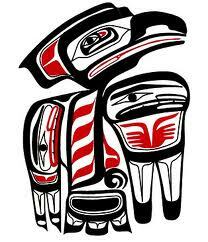 I wanted to communicate with the Spirit of the Bear, who’s Powers, according to Olaus, were seen as being very similar to the ones my Ada (father)had taught me about Ee’ren Adik, the Bear Spirit of my Ancestors. Back then I had never encountered a Bear in the wild and was terrrrified – but also filled with anticipation. For my vision sit I had chosen a small clearing deep in the forest. In it’s center was a large flat rock, covered with Lichen. It would become my scrying mirror. Onto it I placed the jaw bone of a Pike, the talisman Olaus had given me to take into the forest. Next to it I build a small lean-to out of fallen branches and there I spread my blanket and faced Nature – with cold nights and drizzly rain, myself and my fears, which were mitigated by the comforting hoots of an Owl that roosted nearby, but that I never quite got to see. I had a powerful vision, being confronted by “Otzo” the Bear and eventually mating with Him and melting into Him. Bear would guide me, feed me and I would facilitate healings, singing his name….. When I returned from my forest quest and related parts of my experiences, Olaus said, that Ukko had send me the Bear and now I must follow it. Only now, looking back today, I know, how true this would turn out to be: Bearpaw Jewellery, our business indeed feeds me/ us, spiritually and by providing us with a good living. And yes, upstairs in my home there is the huuuuge Bear fur, where I put my patients and clients when doing healing work, which always involves Bear chants. There were many auspicious encounters during that summer: Tending to a dying Swan, that had been caught in fishing net for days before I found it and relating this back to the Swan Maidens of Siberia, but also to the beautiful maiden Aino of the Kalevala….. There also was a visit with Tellervo, the daughter of the Forest Spirit at the pictograph site of Astuvansalmi, competing with 2 Moose while picking giant Mushrooms at nearby lake Saima. Then there was the rather rainy week I spend further north neat …….. among the Sami and their Reindeer and many other meaningful encounters, all worthy of their own essay…. When it was time to return home I had a much deeper understanding about myth, magic, the deep rooted similarities of different shamanic cultures, of Bear Medicine and of myself.